The Color of Pomegranates (Russian: Цвет граната, Tsvet granata; Armenian: Նռան գույնը, Nřan guynə) is a 1969 Soviet art film written and directed by Sergei Parajanov. It is a poetic treatment of the life of the 18th-century Armenian singer Sayat-Nova. It has appeared in some scholarly polls of the greatest films ever made. The Color of Pomegranates is a biography of the Armenian ashug Sayat-Nova (King of Song) that attempts to reveal the poet's life visually and poetically rather than literally. The film is presented with little dialogue using active tableaux which depict the poet's life in chapters: Childhood, Youth, Prince's Court (where he falls in love with a tsarina), The Monastery, The Dream, Old Age, The Angel of Death and Death. There are sounds and music and occasional singing but dialogue is rare. Each chapter is indicated by a title card and framed through both Sergei Parajanov's imagination and Sayat Nova's poems. Actress Sofiko Chiaureli notably plays six roles in the film, both male and female. According to Frank Williams, Paradjanov's film celebrates the survival of Armenian culture in the teeth of oppression and persecution: "There are specific images that are highly charged — blood-red juice spilling from a cut pomegranate into a cloth and forming a stain in the shape of the boundaries of the ancient Kingdom of Armenia; dyers lifting hanks of wool out of vats in the colours of the national flag, and so on". Parajanov, the director, said his inspiration was "the Armenian illuminated miniatures. I wanted to create that inner dynamic that comes from inside the picture, the forms and the dramaturgy of colour." He also described this film as a series of Persian miniatures. His close friend Mikhail Vartanov has maintained that Parajanov's misunderstood cinematic language is "simple and only appears to be complex" and he partly demystified it in Parajanov: The Last Spring. Some Russian versions of The Color of Pomegranates have Special Edition features. The Memories of Sayat Nova, by Levon Grigoryan, is a 30 mins synopsis that explains what is happening in the tableaux and in each chapter of the poet's life. G. Smalley asserts that every carefully composed image in The Color of Pomegranates is coded to a meaning, but the key to interpreting them is missing. He agrees with Parajanov that "If someone sat down to watch The Color of Pomegranates with no background, they would have no idea what they were seeing." The making of the film and its different versions are explored in the other special features: "Introduction" by writer and filmmaker Daniel Bird; The World Is A Window: Making The Colour of Pomegranates - a new documentary by Daniel Bird; "Commentary" by Levon Abrahamyan moderated by Daniel Bird. The film was shot at numerous historic sites in Armenia, including the Sanahin Monastery, the Haghpat Monastery, the St. John church at Ardvi, and the Akhtala Monastery. All are medieval churches in the northern province of Lori. Locations in Georgia included the Alaverdi Monastery, the countryside surrounding the David Gareja monastery complex, and the Dzveli Shuamta complex near Telavi. Azerbaijani locations included the Old City of Baku and Nardaran Fortress. Soviet censors and Communist Party officials objected to Parajanov's stylized, poetic treatment of Sayat-Nova's life and complained that it failed to educate the public about the poet. 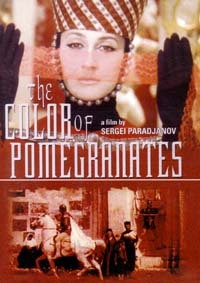 As a result, the film's title was changed from Sayat-Nova to The Color of Pomegranates, and all references to Sayat-Nova's name were removed from the credits and chapter titles in the original Armenian release version. The Armenian writer Hrant Matevosyan wrote new, abstractly poetic Armenian-language chapter titles. Officials further objected to the film's abundance of religious imagery, although a great deal of religious imagery still remains in both surviving versions of the film. Initially the State Committee for Cinematography in Moscow refused to allow distribution of the film outside of Armenia. It premiered in Armenia in October 1969, with a running time of 77 minutes. The filmmaker Sergei Yutkevich, who had served as a reader for the script in the State Committee for Cinematography's Script Editorial board, recut the film slightly and created new Russian-language chapter titles in order to make the film easier to understand and more palatable to the authorities. In addition to cutting a few minutes worth of footage—some of it clearly due to its religious content—he changed the order of some sequences. The film ultimately received only a limited release in the rest of the Soviet Union, in Yutkevich's 73 minute version. On review aggregator website Rotten Tomatoes, the film has an approval rating of 93% based on 14 retrospectively collected reviews, with an average rating of 7.1/10. In 1980 Janet Maslin of The New York Times wrote that "the film is elusive in any circumstances. However, anything this purely mysterious has its magic." The Color of Pomegranates made the Top 10 list for 1982 in Cahiers du cinéma. Filmmaker Mikhail Vartanov has said: "besides the film language suggested by Griffith and Eisenstein, the world cinema has not discovered anything revolutionarily new until The Color of Pomegranates, not counting the generally unaccepted language of the Andalusian Dog by Buñuel". According to Michelangelo Antonioni, "Parajanov's Color of Pomegranates is of a stunningly perfect beauty. Parajanov, in my opinion, is one of the best film directors in the world." Film critic Gilbert Adair argued that "although in both style and content it gives us the impression, somehow, of predating the invention of the cinema, no historian of the medium who ignores The Color of Pomegranates can ever be taken seriously." The work ranked 84th in the 2012 Sight & Sound critics' poll of the world's greatest films and appeared in another list of the greatest films by Time Out. In 2014 the film was digitally restored and re-edited to be as close as possible to the director’s original vision and world premiered at the 67th Cannes Film Festival. The US premiere took place on 20 September 2014 at The Academy at Los Angeles County Museum of Art (LACMA) and was introduced by Martiros Vartanov. The East Coast premiere took place at the 52nd New York Film Festival on 2 October 2014, and was introduced by Scorsese. The restoration was completed by Martin Scorsese's Film Foundation in conjunction with Cineteca di Bologna, and was, described by critic and Toronto festival programmer James Quandt as "a cinematic Holy Grail". Martin Scorsese received the 2014 Parajanov-Vartanov Institute Award for the restoration of The Color of Pomegranates. A Blu-ray of the restoration was released in the UK on 19 February 2018, and an American release by Criterion with Mikhail Vartanov's 1969 documentary The Color of Armenian Land on 17 April 2018. ^ a b c d Paley, Tony (7 October 2014). "The Colour of Pomegranates: a chance to savour a poetic masterpiece". The Guardian. Guardian News and Media. Retrieved 23 April 2018. ^ Galstanian, Nairi (16 January 2014). "A Conversation with Tigran Mansurian". Music & Literature. Retrieved 23 April 2018. ^ a b "The Color of Pomegranates (Sayat Nova)". Parajanov.com. Parajanov-Vartanov Institute. Retrieved 23 April 2018. ^ Wakeman, John, ed. (1987). World Film Directors. 2: 1945-1985. H. W. Wilson Company. p. 737. ISBN 978-0824207632. ^ Matossian, Nouritza (1999). "Armenian Rhapsody". The Independent. Financial Times. Retrieved 23 April 2018. ^ Golubock, D. Garrison (28 February 2014). "Parajanov's Influence Still Spreading on 90th Anniversary". The Moscow Times. Retrieved 27 March 2018. ^ "Parajanov: The Last Spring". Parajanov.com. Parajanov-Vartanov Institute. Retrieved 23 April 2018. ^ Steffen, James (15 October 2010). "The Color of Pomegranates: four DVD editions compared". Dreams and Pomp. Retrieved 23 April 2018. ^ Smalley, Gregory J. (11 May 2016). "238. THE COLOR OF POMEGRANATES (1969)". 366 Weird Movies. Retrieved 27 March 2018. ^ Steffen, James (2013). The Cinema of Sergei Parajanov. Madison: University of Wisconsin Press. pp. 128–129. Retrieved 23 April 2018. ^ "The Color of Pomegranates (1980)". Rotten Tomatoes. Fandango. Retrieved 22 June 2018. ^ Maslin, Janet (6 October 1980). "SOVIET POMEGRANTES". The New York Times. The New York Times Company. Archived from the original on 20 March 2017. Retrieved 20 March 2017. ^ Johnson, Eric C. "Cahiers du Cinema: 1951-2011". Mist Driven Enterprises. Retrieved 23 April 2018. ^ "Main". Parajanov.com. Parajanov-Vartanov Institute. Retrieved 23 April 2018. ^ "Votes for The Colour of Pomegranates (1968)". The Greatest Films of All Time 2012. British Film Institute. Retrieved 20 March 2017. ^ Time Out Film Guide. "Top 100 Films (Centenary) (part 4)". Filmsite.org. AMC Networks. Retrieved 23 April 2018. ^ "The Color of Pomegranates". Parajanov.com. Parajanov-Vartanov Institute. Retrieved 23 April 2018. ^ "Sayat Nova". Cannes Film Festival. Retrieved 23 April 2018. ^ "The Color of Pomegranates Blu-ray". Blu-ray.com. Retrieved 23 April 2018. ^ "The Color of Pomegranates". The Criterion Collection. Retrieved 23 April 2018.